What Brexit Might Mean for the UK Pig Industry and Trade? In this edition of Horizon, AHDB examines pork industry trade flows between the UK, the EU and its other major global trading partners, as well as looking at how trading relationships might change after the UK leaves the EU. In addition, the report examines the major global trade flows, in order to identify areas of potential market growth for UK exports, as well as areas that may be vulnerable to increased competition in a post-Brexit trading environment. 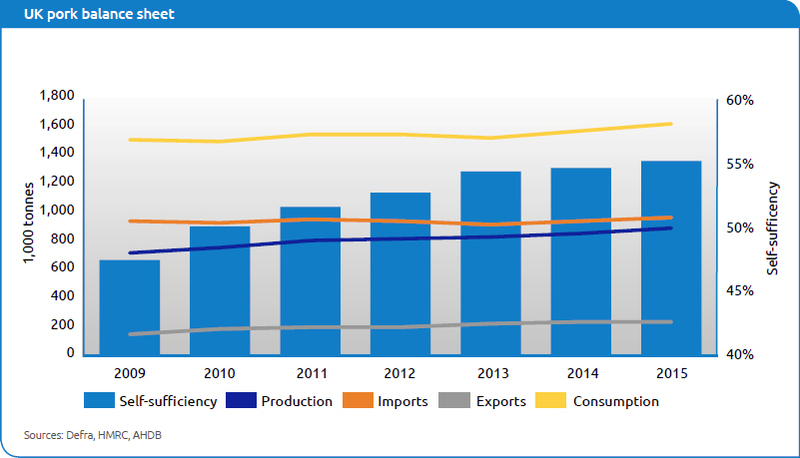 Pork exports have been steadily increasing over recent years. Domestic demand is strong for loin and leg cuts, in particular, so exports mainly aim to find better markets for other products, which have a higher value overseas than in the UK. These markets also help to reduce the volume of waste, by taking products for which there is little or no value in the UK, such as offal. Pork exports have grown by over 50,000 tonnes since 2010, and have increased from 21 per cent to 26 per cent of production, with a further rise expected this year. Offal exports have more than doubled over the same time period, assisted by improved market access outside the EU. Offal exports were almost 59,000 tonnes in 2015 versus 28,000 tonnes in 2010, with 2013 the only year showing a fall in export volumes over the past six years. 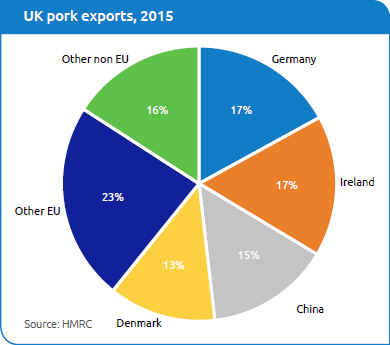 In 2015, 70 per cent of UK pork exports went to fellow EU Member States. Germany and Ireland were the main destinations for UK pork. 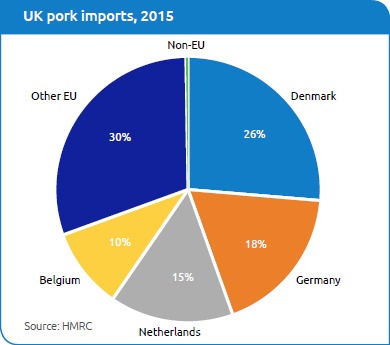 Denmark and the Netherlands were also major recipients but much of this pork is thought to be for re-export to third countries, partly reflecting the EU ownership of some UK processors. Shipments to Germany are predominantly of sow meat; the vast majority of UK sow meat is exported as there is little domestic demand for products containing it. Exports to China accounted for 15 per cent of all pork shipments in 2015, and have grown significantly throughout 2016. Shipments to the United States grew sharply through 2015 and 2016 and the expansion of this market creates more value, due to the higher-value cuts involved. steadily year-on-year. Denmark is the dominant supplier, accounting for over a quarter of all UK pork imports. Together with Germany and the Netherlands, they account for 60 per cent of imports. The EU supplies virtually all the pork imported into the UK, due to the high import tariffs on pork from elsewhere. Fresh and frozen pork makes a little over 40 per cent of all pig meat imports (the remainder being processed products). Almost 80 per cent of this is fresh/chilled, the majority being boneless cuts, which will achieve higher prices as little or no further processing is required and transport costs are lower. The remaining 20 per cent is frozen product, predominantly made up of boneless cuts. The main non-tariff barriers limiting access to the EU market are sanitary and phytosanitary (SPS) measures. There are a range of such requirements but perhaps the most significant is the widespread use of the EU-banned growth hormone Ractopamine, especially among producers from the United States. This would probably limit imports to a large extent, even if tariffs were removed, although the level of hormone-free production is rising. Russia was one of the largest importers of EU pork prior to it banning all EU pig meat in 2014 on the grounds of concerns over African Swine Fever (ASF). However, the World Trade Organisation (WTO) has now ruled this ban unlawful, although it remains to be seen how Russia will respond to the ruling. The UK may decide to keep import tariffs on pork at current EU levels and apply these to EU imports, unless a trade deal is struck. It could also decide to apply quotas to allow some imports. These actions could significantly limit the volume of EU pork entering the UK market. In the shorter term, this action would significantly tighten supplies on the domestic market, while domestic production responded to the change in trade flow. With the tightening of supplies, it would be expected that pig price could rise sharply. However, it is hard to predict how this action would affect the UK market in the longer term. Due to the issue of carcase balance, there would be a large excess of the less popular cuts required if domestic production were to satiate the demand for the more popular parts. This excess product would need to find a market – either at home or abroad. Consumer demand for pig meat could also be affected if customers did not respond favourably to price rises. Depending on the extent of similar issues for other meats, demand may be difficult to stimulate if, and when, supply levels recovered. Carcase balance, as well as overall demand, may be addressed by increasing trade with non-EU countries, such as China. This may depend on updating existing bilateral trade agreements to reflect the UK’s departure from the EU. The UK will be able to prioritise negotiation of FTAs which could benefit pork exporters and might be able to react quicker to any changes in policy or demand set by importing countries. The benefits would arise particularly from delivering better values for exports of lower-value cuts and offal. This could improve returns to the UK industry, as these products have little or no value on the domestic market. As well as China, there may be opportunities in emerging markets elsewhere in Asia and Africa, if the right trade deals can be negotiated. Complex FTA-type deals may not be required, if regulatory and trading arrangements can be agreed. If the UK was to leave the EU before a trade deal was agreed, this would leave it vulnerable to tariffs being applied on its exported pig meat to other EU countries. Given that the EU accounts for 70 per cent of all pork exports, this could have a sizeable impact on the UK’s export market, with a knock-on effect on prices. 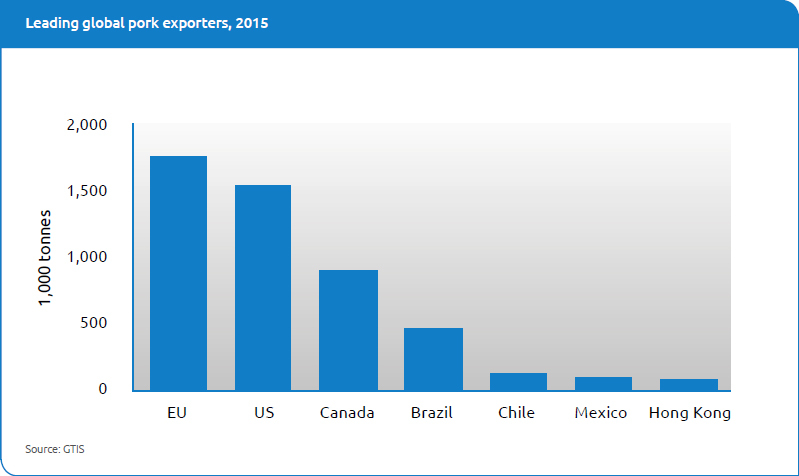 One particular issue could be exports of sow meat. Germany is the main destination for cull sows, which have little value on the domestic market. 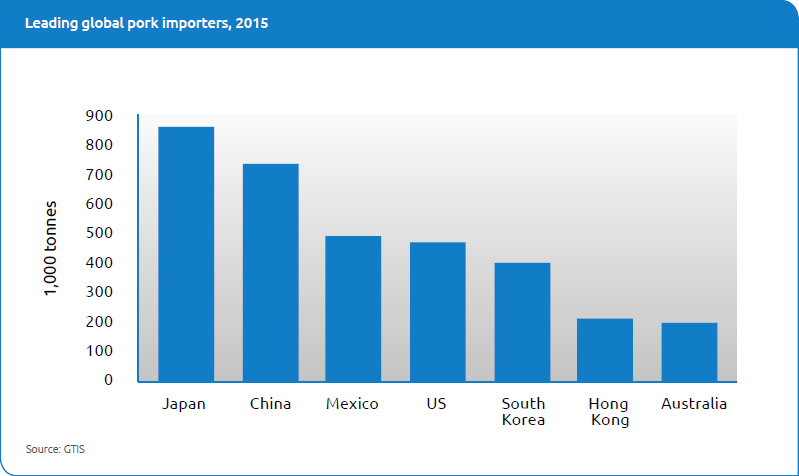 Therefore, if these exports were subject to tariffs, it could have significant implications for this market, with sows potentially having little or no value. While this only forms a relatively small part of producers’ incomes, it would certainly have an effect on profitability. As with other meats, there is a risk that access to some markets for pig meat or offal depends on the UK following EU rules and regulations. If trade deals are not renegotiated, this trade could be closed off, at least temporarily. Should the UK decide not to impose tariffs on imports, or negotiate quotas with global exporters, this may leave the UK market vulnerable to cheaper pork, for example from the US, Canada or Brazil, which operate at a much lower cost of production. This could cause a large over-supply in the domestic market and it would take some time for production levels to respond accordingly. While much of this additional supply may displace imports from the EU, the UK pig price would be negatively affected. This could lead to a substantial reduction of the size of the UK breeding herd. Consumer demand may increase should the price fall but recent history has shown that this may not always be the case and there are a myriad of other factors affecting the purchase decision.